Our mission is to design and build environmentally friendly structures that enrich lives, add convenience, save time, and increase property value. When you buy from Anchorage Sheds you buy a shed “Built Alaska Tough”! You’ll be happy to know your building from Anchorage Sheds is maintenance free. No need to repaint. Our metal can withstand the strong Alaska winds, hail damage and is much more fire resistant than traditional siding sheds. In addition to all these benefits, our metal is eco-friendly. Our goal is to make each customer encounter a delightful experience, with the highest standard of integrity reflected in all relationships -sales, construction, and delivery. Denali Sheds: Our Denali Sheds feature two lofts in each building. These lofts are really nice for storing your extra fishing gear through the winter, or your Christmas decorations through the summer! You may want to use yours as a hobby studio, a woodworking shop, your man-cave, garden shed, or simply a space for extra storage! Each Denali Shed includes a set of fiberglass double doors, with a Diamond plate threshold. You may select optional upgrades of work benches, shelving, windows and doors. We place these items exactly where you want them. Each Denali Shed is delivered with an unfinished interior so you can finish it in your style. Each Denali Shed comes with a 4-foot loft on each end of the building. Every building has Green Treated 2 x 6 floor joists spaced 16” on center. We use ¾” tongue & groove flooring. Wall studs are spaced 16” on center, with a strong ½” OSB sheeting. The same ½” OSB sheeting is used on the roof. We put down a premium synthetic underlayment on the roof before we install the metal roofing. You may choose the metal colors to create your very personalized special place! Denali Studio Cabin: Our Denali Studio cabins offer a refreshing option in the maintenance free lifestyle. You will relax well knowing your investment will weather the storms of life! You will have more time doing what you love to do, because you will not need to spend time maintaining your cabin! Each studio cabin is delivered with an unfinished interior so you can finish it in your style. Each studio cabin comes with either a 6 foot, or an 8-foot loft on each end of the building. Our studio cabins also include a 4-foot porch with maintenance free Trex flooring, a rock accent on the porch, one 2’ x 2’ window in the loft above the porch, 3 insulated 3’ x 3’ windows, and a 9 lite house door. Our Denali Studio Cabins have Green Treated 2 x 6 floor joist spaced 16” on center. We use ¾” tongue & groove plywood flooring. Wall studs are spaced 16” on center, with a strong ½” OSB sheeting. The same ½” OSB sheeting is used on the roof. We put down a premium synthetic underlayment on the roof before we install the metal roofing. 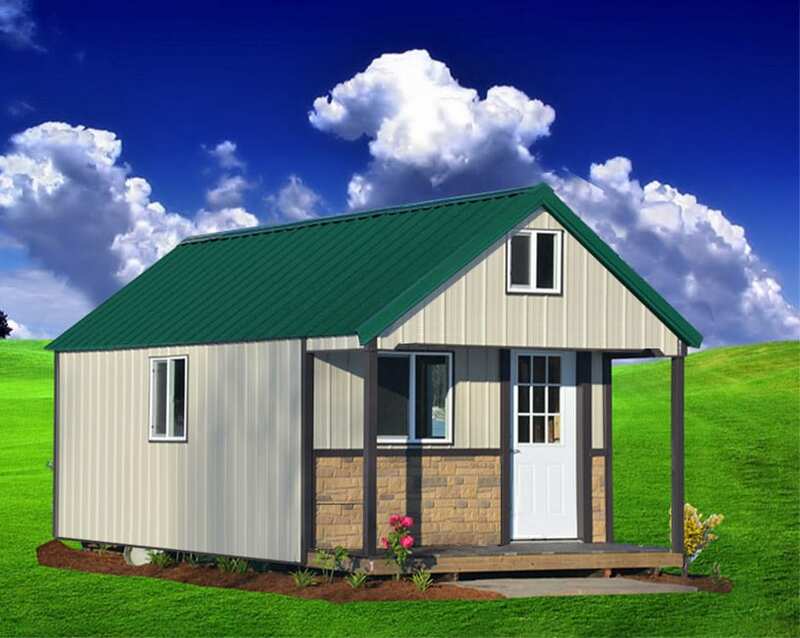 When ordering your studio cabin, you choose the placement of all doors & windows, & you get to choose the color of the siding, roofing, & trim. Kenai Sheds: Our Kenai Sheds feature walls of 93” inside height, and a regular ranch style roof. Kenai Sheds do not have lofts, so that gives you a lot more head room. 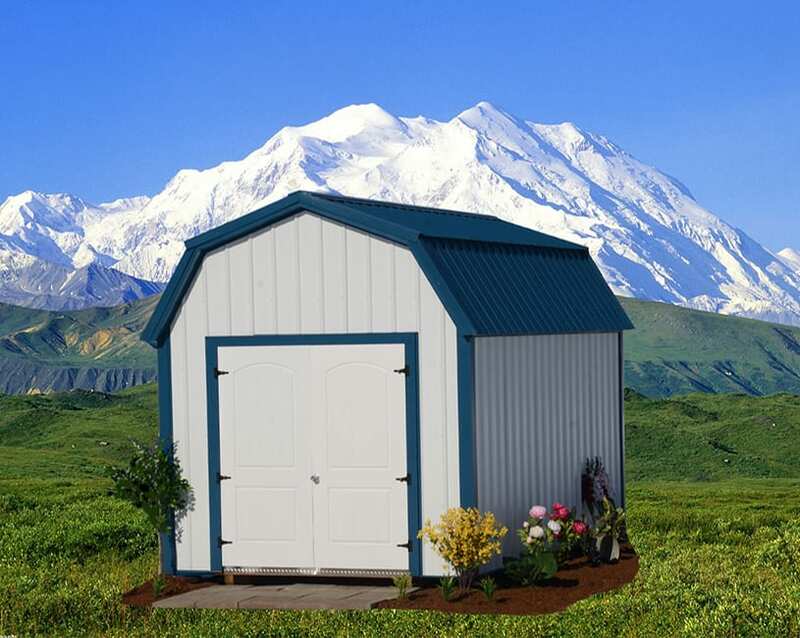 You may want to use your Kenai Shed as an office, a bedroom for your big kids, a hobby studio, a woodworking shop, your man-cave, garden shed, or simply a space for extra storage! 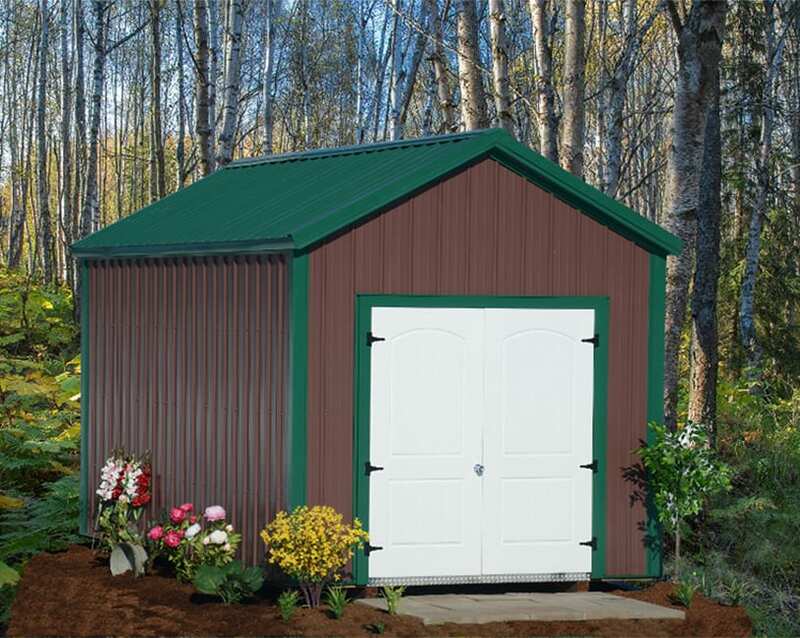 Each Kenai Shed includes a set of fiberglass double doors, with a Diamond plate threshold. You may select optional upgrades of work benches, shelving, windows and doors. We place these items exactly where you want them. Each Kenai Shed is delivered with an unfinished interior so you can finish it in your style. Every building has Green Treated 2 x 6 floor joists spaced 16” on center. We use ¾” tongue & groove plywood flooring. Wall studs are spaced 16” on center, with a strong ½” OSB sheeting. The same ½” OSB sheeting is used on the roof. We put down a premium synthetic underlayment on the roof before we install the metal roofing. You may choose the metal colors to create your very personalized special place! Kenai Studio Cabins: Our Kenai Studio Cabins offer a refreshing option in the maintenance free lifestyle. You will relax well knowing your investment will weather the storms of life! You will have more time doing what you love to do, because you will not need to spend time maintaining your studio cabin! Our Kenai Studio Cabin feature walls of 93” inside height, and a regular ranch style roof. Each studio cabin is delivered with an unfinished interior so you can finish it in your style. Our Kenai Studio Cabins do not have lofts, so that gives you a lot more head room. 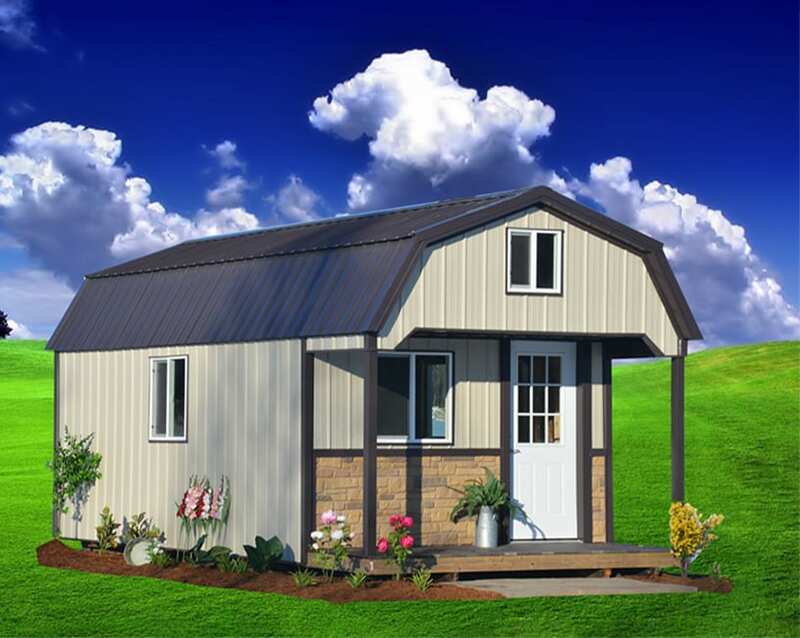 Our studio cabins include a 4-foot porch with maintenance free Trex flooring, a rock accent on the porch, 3 insulated 3’ x 3’ windows, 1 insulated 2′ x 2′ window, and a 9-lite house door. Our Kenai Studio Cabins have Green Treated 2 x 6 floor joist spaced 16” on center. We use ¾” tongue & groove plywood flooring. Wall studs are spaced 16” on center, with a strong ½” OSB sheeting. The same ½” OSB sheeting is used on the roof. We put down a premium synthetic underlayment on the roof before we install the metal roofing. 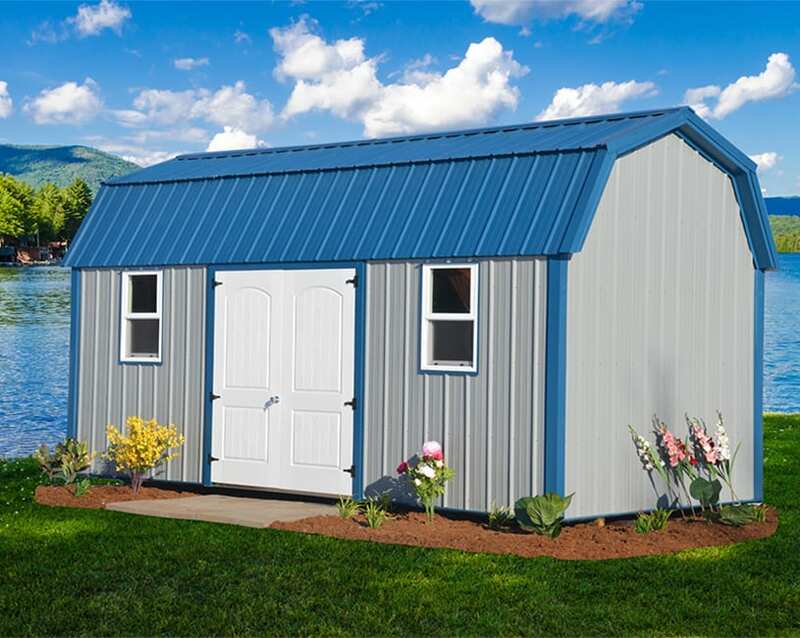 When ordering your studio cabin, you choose the placement of all doors & windows, & you get to choose the color of the siding, roofing, & trim. Alaska, a land where the forces of nature challenges not only our resolve, but also the homes we live in, the vehicles we drive, and other things we own, including our boats, fishing equipment, snow machines, 4 wheelers, lawn mowers, bikes, garden tools, and hobby equipment to name a few. Our sheds also provide the space to finally get organized! We offer shelving so you can get to the things you need, when you need them! At Anchorage Sheds, our mission is to provide the most durable storage solution for this harsh environment. We do this by building maintenance free structurally superior portable buildings that will last for many years to come! We offer sheds & cabins that will not only last a long time, but they are beautiful! They can help create that backyard sanctuary you’ve dreamed about! Your dreams of spending quality time with your grand-kids, or your best friends can now become reality! Anchorage Sheds LCC. is a family owned business based in Soldotna, AK. Growing up in a close-knit Mennonite community in western Maryland, we learned a lot about hard work, & a job well done! My father was a general contractor, an avid wood worker, and our church pastor. He taught his family to love God with all their heart, treat your customer as you would like to be treated, under promise & over deliver! With these values in mind, we offer the best choice of sheds built for the tough Alaska environment. 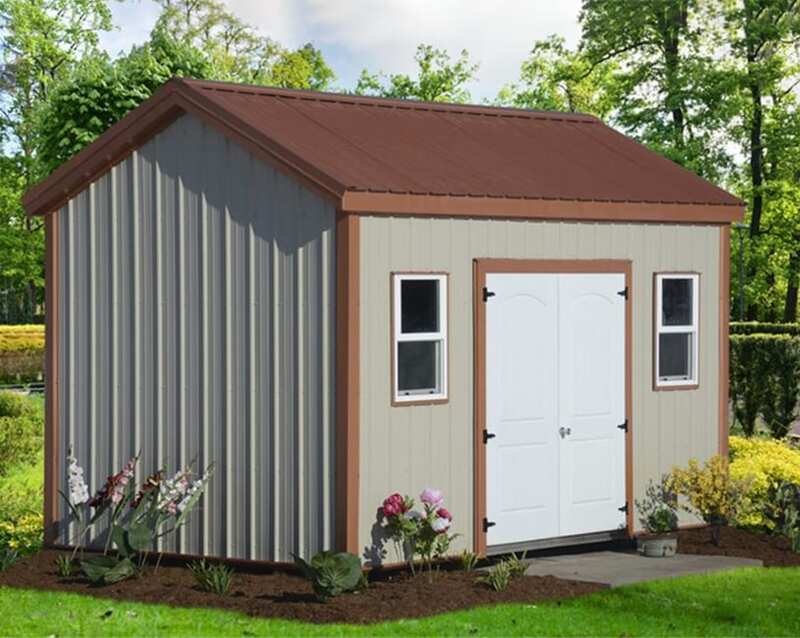 From precise craftsmanship, high quality materials, to using our 40-year metal siding & roofing, our sheds will stand strong against the forces of nature that will weather inferior products. We offer a completely maintenance free building that will not only last for many years, but will beautify and enhance the value of your property as well! It’s a great feeling knowing you’ve chosen an environmentally friendly product built with renewable resources! The energy efficiency of our 40-year metal is unbeatable! We have colors that will make your building blend into its surroundings, or stand out to let your neighbors know that you are “the Joneses”! “From our family and our extended family of builders, office personnel, dealers, & delivery drivers, we want to express our appreciation for your interest in our buildings! We thank you for the confidence you put in us, & we want you to know that we take that responsibility seriously! Our goal is to build more than simply high quality sheds & cabins! We are interested in building lasting relationships! We believe good relationships are the basis for success in life & in business! We wish you the best! From our family to yours! Each building is hand crafted with care. We use only the best materials available. They call it, Appearance grade materials or SPF! And it shows! You can walk into our building & you will notice the quality materials immediately, -very little bark and very few knots. Not to mention the quality craftsmanship! We love what we do, & it shows! We begin with Green Treated (ground contact rated) skids & Green treated 2 x 6 floor joists spaced 16”on center. We use ¾” tongue & groove plywood flooring. The wall studs are spaced 16” on center, then covered with a full 15/32” OSB sheeting. Our trusses are 2 x 6 & spaced 24” on center. The same full 15/32” OSB is used on the roof. We install a layer of premium synthetic underlayment onto the roof before we install the metal roofing. Our building also have a 6” overhang on the gable ends, and a 4” overhang on the sides. Not only does this add to durability of the building, it also looks so much better! We use premium metal roofing and siding that has a 40-year warranty. When placing an order, you get to choose the colors you want! You may select optional upgrades such as workbenches, shelving, windows & extra doors. We place these items exactly where you want them! Each building comes with a set of fiberglass double doors, a diamond plate threshold, and a locking doorknob. 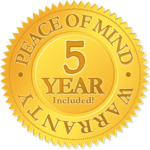 We warrant our buildings for 5 years against defective workmanship, and materials. The metal siding & roofing has a 5 Star, 40-year warranty from the manufacturer. Our metal can withstand the strong Alaska winds, hail damage and is much more fire resistant than traditional siding sheds. In addition to all these benefits, our metal is eco-friendly. Our rolled-form panels and trim are 100% recyclable. Why pay for a storage unit way across town when you can have storage in your own backyard? Why not build your own assets instead of someone else’s? With Anchorage Sheds’ Rent-to-Own option, you can enjoy the convenience of extra storage and a beautiful building in your very own backyard! To get started all you need 5% down & the first month’s rent. That’s all. We then deliver the building right to your doorstep! Then you choose to pay your affordable monthly payments for the full 36 months or pay off as early as you like with no penalty at a significant discount. Both options result in you assuming full ownership of the building! If you decide you no longer need the building, you may choose to return it at any time. Just simply give us a call & we’ll come by & pick it up. You are then released of any financial obligation of the agreement. We love hearing from our customer base. Reach out to us with any questions, comments or concerns and one of our knowledgeable sales representatives will be happy to help!